The TORCH contains eight high powered UVC lamps to provide quick disinfection times. It simply plugs into any standard wall outlet. 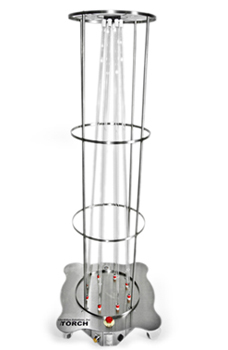 Each TORCH tower produces an efficient UVC output of 12 mJ/minute (0.18 mw/cm2) to get a calculated 99% reduction of MRSA in 10 seconds and Clostridium difficile in 1 minute at 10 feet. The TORCH system is designed to be so economical that multiple units are affordable enough to place into a room at the same time to eliminate shadow areas and maximize coverage for the most thorough disinfection process. Visit www.cleanhospital.com for complete information on our Ultraviolet Light line of products. The TORCH Tower can be plugged into any standard 115 VAC outlet. An optional sensing module can keep track of your total cycle dosage.